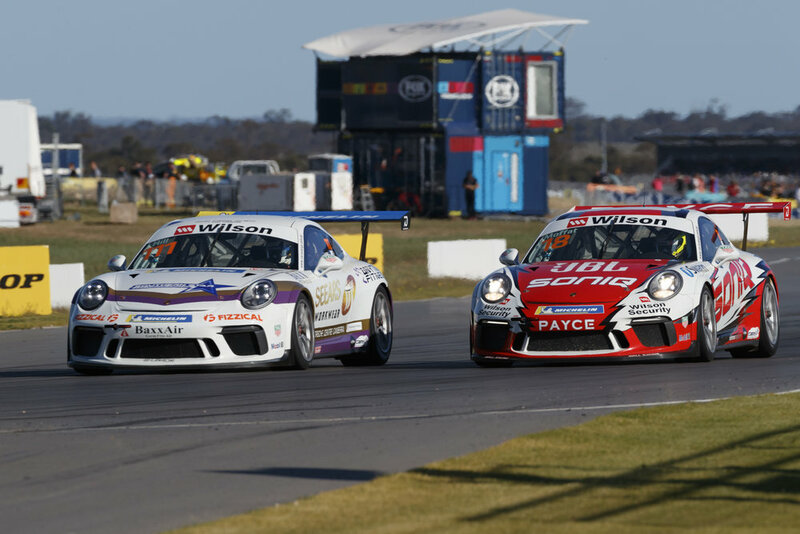 Cameron Hill has described his team’s performance in Round 6 of the Porsche Wilson Security Carrera Cup at Tailem Bend this weekend as “absolutely superb” following another pair of top-eight finishes in Races 2 and 3 today. After his sixth-place finish in yesterday’s 20-lapper, Hill finished seventh in the second race after a close battle with former Supercars driver Dale Wood, the cars swapping places on a couple of occasions. In Race 3, Hill latched onto the back of the leading pack, and engaged in close combat with title contender Dylan O’Keeffe. While he surrendered a place to the recovering James Moffat, the eighth-place finish was still enough for the Canberra driver to take seventh for the round. “We made some more changes to the car overnight and it was better again,” Hill said. “In Race 2 I was able to race wheel-to-wheel with Dale, and in Race 3 I learned a lot by following Dylan – there were a few times where I could have gone for a low-percentage move, but I decided against the risky option. “Not only were we starting at a disadvantage to most other teams due to our lack of testing at The Bend, our team was also running a couple of cars in the Australian Formula Ford Championship – for our small operation, it was a complex logistical exercise. “Not only were we competitive in Carrera Cup, both our Formula Fords were fighting for podium places all weekend and Tom Sargent ended up second overall; a great reward for everyone’s efforts. “To cope with the extra workload, we were assisted by some extra people this weekend and I’d especially like to thank David Macmillan from DNA Racing for his help with the Porsche, and the crew who looked after our Formula Ford program. “We can now say we genuinely have a package capable of running with the main contenders, and I can’t wait for the last two rounds of Carrera Cup at Bathurst and the Gold Coast,” Hill concluded.